I'm a little bit obsessed with colour at the moment. These suede courts from Topshop are nothing if not colourful and so, with a little predictability, I have fallen in love with them. Pink and orange is an ace colour combination and one you shouldn't be scared of. 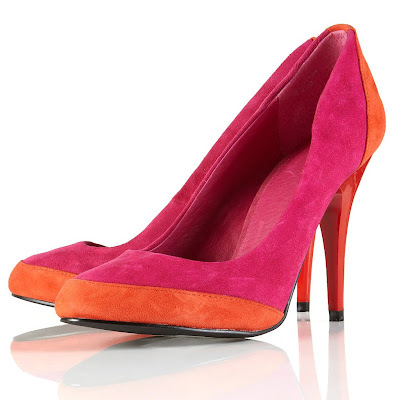 The easiest way to wear these would be with some black skinny jeans and a contrasting top - maybe bright blue or green. Or how about adding them to a totally colour blocked outfit if you're feeling daring? Like them? They're only £46 which is a bargain for Topshop.